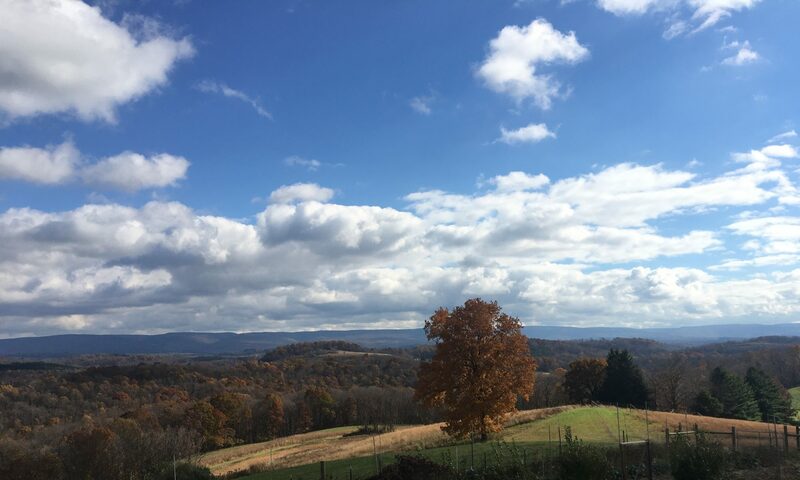 Before Thanksgiving we were blessed to be able to visit the Dougherty’s, a farming and homesteading family in southeastern Ohio, with whom we became acquainted when they spoke at the Mother Earth News Fair in Seven Springs, Pennsylvania. Beth and Shawn are wonderful, knowledgable, and generous folk, of whom we have spoken before in this blog, and luckily for the world of farming have produced a wonderful book The Independent Farmstead. Having enthusiastically devoured this excellent tome, we were wondering if we could make a visit, since they live only about 2 1/2 hours drive away from us. We were especially interested in how they handle springs and seeps, since we have been made aware that we will depend on these for the water supply on our farm (see previous blog). The visit surpassed our expectations, both on how welcoming they were, and in how brilliantly they have adapted multiple strategies to harvest that resource so critical to all our lives. Below was the first thing we saw on our tour. A small spring exits the hillside and is captured in a large pipe. What Shawn and Beth have done is to drop a 55 gallon drum cut in half just below it and plumb in a spigot that feeds a hose, which supplies a lot of the water for their garden and animals close to the house. The next fascinating invention was where the water from a seep on their hillside is collected by buried curtain drain pipe that is simply dug into the hill where there was a damp spot. It is angled into a collecting pipe and drips into a reservoir from which another buried pipe fills this small cistern from the bottom. Water is available for use from the pipe in the center, which allows sediment to collect at the bottom, resulting in pristine pure and delicious water for ducks, pigs and sheep! Brilliant! Below are the ubiquitous storage vessels where the wondrous liquid is stored after harvesting from the earth. These are called “IBCs” (Intermediate Bulk Containers) and are used by any industry needing to transport large volumes of liquid. They are everywhere on the Dougherty’s farm and will soon be a common site on ours! An added bonus to our visit was the interesting layer-hen “tractor” constructed of electrical metal conduit and 1×6 beams covered with plastic. This is very cheap and light so it will be easy to move around the fields giving continual access to fresh green grass, herbs and weeds and protection from predators. We are sure that some version of this will soon grace our own fields. Finally, we helped Beth and Shawn move some cattle onto fresh pasture. this is accomplished quickly and easily using push-in posts and some electric twine. So, pumped up with new information and enthusiasm, we came back to our farm ready to employ some of these techniques to access water for livestock and vegetables. We are very grateful to the Dougherty’s for allowing us to visit them, to spend so much time with us, and even to provide lunch harvested from their farm, complete with homemade cheese! They are real, down to earth (ever wonder where that phrase originates – obviously from describing farmers!) farmers who learned these things over many years and have developed tried and tested means to harvest both food and water from difficult terrain. We recommend their book to anyone who farms and if you are able to visit, you will find them to be gracious, generous, delightful people who will share their knowledge and time selflessly. We have gained a lot of knowledge, and we hope, some lifelong friends in the process. The Kerlin family and critters wish all of you a very blessed Thanksgiving, full of joy and love and thankfulness! There are so many people suffering silently and alone in the world. As we enjoy ourselves with food, family and friendship, we remember those who will go without these blessings this holiday – those who are poor, homeless, grieving the loss of a loved one, those with no family. Count your blessings, however little they may be. There may always seem to be someone who has “more” than you in the eyes of the world, but there are many more who have much less. Do you remember in our last post that we outlined the necessity for a good fencing system on a farm? Well (remember this word, “well,” as it encompasses the subject of the current blog), there are a few things even more essential to the farmer than a good fence, important though it be! One of these is a supply of drinking water, both for animals and for the humans caring for them. Our saga began towards the end of a long dry spell here in western Pennsylvania. We have a very low producing well on this property, and despite digging down another 250 feet after we moved in, it would still only give us a renewal rate of about 1/2 to 1 gallon per minute. Still if we were careful, (after the installation of 3 large cisterns in the basement for a water reservoir) we decided that would still be enough for us and the future 100-150 sheep we were expecting to raise here. Sheep, after all, only use about 2 gallons of water a day – they are actually considered desert animals (and thankfully they don’t shower or do laundry.) All seemed to be going along swimmingly (if you’ll excuse the use of this word in the current situation), until Roy noticed that the cisterns were down to 75% capacity, and each day they were lower until they reached 25%, and we decided that we had a crisis on our hands. So, with much dismay we began looking into the cost of buying about 1000 gallons of potable water to be delivered for our use. But also we realised that our dream of developing a commercially viable sheep farm was quickly disappearing down the proverbial gurgler! I mean it doesn’t take a genius to figure out that no water = no animals. Contact with our local well guy brought us no relief as he told us that wells were drying up all over the area, and that many wells will take months or years to recover! At our wits’ end and not knowing where else to turn, we asked a very good friend of ours, who just happens to be a member of the clergy (Deacon Phil, to be precise) to bless our well with Holy water. Just the fact that he and his wife happened to be here visiting us and helping around the homestead and farm that week was a miracle in itself! We then began a daily novena prayer asking for the intercession of St. Bernadette of Lourdes. Some of you may know of St. Bernadette, a poor peasant girl who discovered a huge spring of water while experiencing an apparition of Mary, the Mother of God in Lourdes, France. Now, do NOT tell us that miracles don’t happen, or that God does not hear prayers. The day after our prayers began, we had a good soaking rain and the water level in the cisterns began to steadily rise. It seems that our well must be drawing from water capillaries that are fairly shallow. That may put us at the mercy of the weather, but overall (notwithstanding the previous unusually dry months leading up to this crisis) the rainfall and snowfall in this area is abundant and steady, so it appears to be more of a blessing than otherwise. The other thing that became apparent is that the downspouts from the roof gutters fed into a common drain which went underground and drained into the adjacent field. We had noticed that there was a 3 inch PVC pipe just breaking the surface in the yard feeding into a perforated drain that continued underground down hill. During the rain the water was actually gushing through this junction, and we realised that we could simply attach a pipe here and feed this into a water capture cistern that could be used for animals or even garden watering. The previous owner’s attention to detail, preventing water problems in the foundation, became an opportinity to capture the huge amount of water coming off the roof. What a find! That same day we noticed the well to be recovering, we invited the previous owner here to drive around the property with us. He showed us a small grotto, hemmed in with briars, rocks and trees, at the top of which was a small, but freely flowing spring!! Now those of you who know the story of St. Bernadette of Lourdes know that she saw the apparition in a grotto, out of which flowed the spring of water that became the famed, miracle-producing water of Lourdes! I am not going to stretch this parallel (or your credulity) any further, but you should know that we were starting to feel both relieved and more than a little amazed. Here is a picture of our grotto from the bottom, looking up at about a 45 degree angle after clearing out some briars – Brer Rabbit would have had a ball in there! And here is a close up showing a shimmer of the water running through the leaves. We intend to develop this spring and give it an opportunity to fill up a pond or cistern, from which we can pump water to the livestock. Now, so far, we have multiple miracles the day after beginning to pray for help! But there is still more, believe it or not. Upon rounding the corner at the bottom of the property, the previous owner remarked, “You know that you own over there toward the road”. He pointed towards a lightly forested acre or two, which we had not really thought about, having many other more pressing things to deal with up to now. “Yes, there’s a small pond in there which was used previously to water cattle”. “Uh huh.” I replied, not really listening until my subconscious, which HAD been paying attention screamed “SAY WHAT?! !” in my ear. “Ummmm, could you repeat that?” I replied quietly, my brain still reeling from the slap my subconscious had justifiably just delivered to me. “It needs some work on the wall and is filled with leaves, but it is a good pond fed from a spring”. Below you can see the property with future fencing lines in red (as we showed in a previoius post) and the newly discovered spring (by us anyway) circled in blue towards the right middle of the picture. The lines in blue at the bottom right are the approximate property lines for the area we’d ignored until now, and the small circle of blue within it is the pre-existing pond. It was very low with only a couple of inches of water amid a lot of fallen leaves, and the berm surrounding it was breached in a couple of places, but it was still beautiful! A little work for a few days with shovels and a chainsaw will restore it back to its original state. It will only be about 30 feet across and maybe 5 feet deep, but do you know what that means to a farmer (and to swimming hole-loving farm kids)? The volume of that pond is about 14,000 cubic feet. There’s about 7.5 gallons per cubic foot of water. So if filled, such a pond can contain about 100,000 gallons of water! Can you see why I was raving on about the power of prayer? Water-wise, we went from destitute to drowning (please excuse the hyperbole, but I needed an alliterative word to make the impact) in less than a day! Now our focus will be on developing these sources to collect and deliver the water to where it will be needed. Friends, farming is one of the best professions for observing the wonders of God’s creation. But it also makes us realize that we have very little control of things and we must depend upon what is given to us. Some might say that depending on prayer in this day and age is childish and perhaps even foolish. But maybe that is why farmers are often the most God-fearing folk around. We realize that we have are not really in charge. This does not mean that we should treat God like some celestial slot machine and that prayer will always give an outcome to our advantage. On the contrary, we should be ready to recieve a “no” answer to our plea. Nay-sayers might say that all these water sources on our farm were always there and just needed to be discovered in the crisis. Maybe this is why in our case the response was dramatic, multidimensional (as outlined above,) and almost immediate. Perhaps letting others know about this was more important than our immediate needs. In any case, we are convinced, and we hope that you agree, that trusting in God and praying for one’s needs, might be highly beneficial and maybe even a little awe-inspiring! Thank you St. Bernadette, and pray for us!